Sous vide techniques are becoming increasingly common in restaurant kitchens...but what about for the home chef? Here is what you need to know about cooking under vacuum. If you watch a lot of televised cooking shows like Top Chef or eat in modern, trendy restaurants, you probably have heard the term "sous vide" before — but you may not know what it means! Sous vide is French for "under vacuum". When food items are prepared using this technique, they are vacuum-sealed into plastic bags, which are then submerged in a precisely temperature-controlled water bath. The food is cooked at a lower temperature for a longer period of time than we usually simmer, bake or otherwise cook things at, so in a way it is like using a crock-pot — except under vacuum. What does this actually do for the food items in question? Well, for one thing it enhances flavors and aromatics intensely. Nothing is lost into steam, water or open air, so vegetables and fruits retain much of their raw, fresh and vibrant taste while still being "cooked". A simple sprig of rosemary and a little olive oil can infuse a piece of meat with incredible flavor. Sous vide cooking also results in incredibly moist, luscious meat, even for cuts which can otherwise be tough or difficult to cook easily. No more dried out, chewy pork chops or chicken breasts; here the meat is thoroughly cooked through without losing its juices and tenderness. It's also a great solution for entertaining, or when you want to prepare a number of portions of food that just need to be reheated and finished for serving — why do you think restaurants love the technique so much? 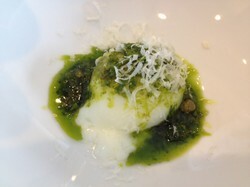 Image above: A soft egg prepared perfectly using sous vide techniques, served with salsa verde and parmesan cheese. Photograph by the author, sockii. 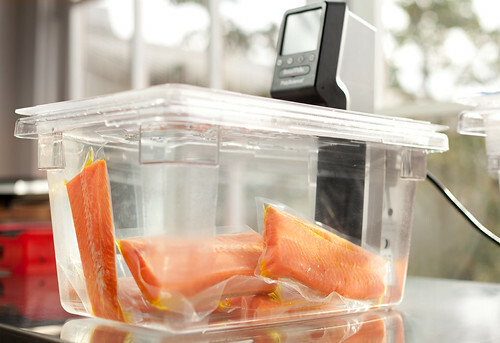 Salmon filets being cooked sous vide, using an immersion circulator in a water bath. On this page I will talk more about the basics of sous vide cooking: the history of its development, the tools you'll need to do it at home, and also some of the important safety concerns and guidelines you need to follow to ensure you can enjoy sous vide-prepared foods in your own kitchen. A tender piece of herb-infused chicken breast, prepared using a combination of sous vide cooking and pan searing. Although it is only in recent years that sous vide has become so hugely popular with chefs, it has actually been described as a cooking technique going back all the way to the 18th century! In 1799, Sir Benjamin Thompson first talked about cooking sous vide, albeit using air instead of water as the medium for heat transfer. Engineers in the United States and in France re-discovered the technique in the 1960s, realizing it could be useful for industrial-scaled food preparation and preservation. Learn more about the history of sous vide cooking at wikipedia. First you will need to prepare your ingredients for cooking. It's always a cook idea to include some seasoning or aromatic herbs along with your protein, fruit or vegetable that you are preparing, but remember that a little will go a long way. A single small snip of thyme or rosemary, for instance, along with a sprinkling of salt can be enough for a steak—remember that you will be searing it before serving, so you can add additional seasonings or sauces at that stage. A little olive or other oil added to the bag can help add flavor as well. Meat in general should be removed from the bone, as sharp edges can pierce the vacuum bags. Once you've sealed your bag, try to shape the product in it so that it is even and attractive in appearance—it will hold that shape after cooking. 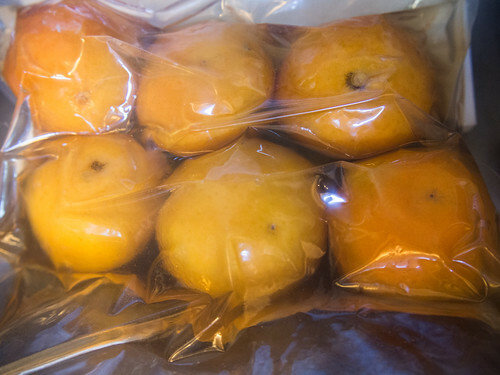 You can leave product in the vacuum bags, at this state, to marinate if you wish, just make sure you do so only in the refrigerator and that it remains at a safe storage temperature up until you are going to cook it. Determine the cooking temperature and time required for your product. Most sous vide recipes have this information carefully calculated. There are also some fabulous apps for your mobile device, such as the SousVide Dash, which will help you calculate time and temperature for just about anything you wish to cook and dependent on your equipment. It will even give you detailed information on product pasteurization and pathogen reduction, so that you can be sure you are preparing your food with necessary safety and care. Fill your waterbath and set the temperature to your desired degree. Once it has reached that temperature, take your vacuum-sealed food bags out of the refrigerator and submerge under water. Cover, if your oven has a lid, and set a timer so that you know when it's done. It's just that simple! If your water bath does not have a cover, you may have to keep an eye on it that the water does not evaporate below safe operation levels, especially during extended cooking times. When the cooking time is up, remove the bags from the water bath. If you have a probe thermometer with a small needle gauge (and sous vide tape to cover the needle hole), you may want to check the internal temperature of your product before proceeding. Otherwise if you are reasonably sure your product is done cooking, proceed on. Now, if you are pre-cooking this product to then serve later (perhaps during an evening dinner party so you've prepared it several hours in advance), it is critical to immediately plunge the bags into an ice-water bath to bring their temperature down into a safe zone. If you just leave it to sit to cool, or put into the refrigerator while still warm, you are inviting the dangerous growth of bacteria! (More on safety concerns and issues below.) In such case just bring the food back up to temperature before serving, and finish the dish as you wish. 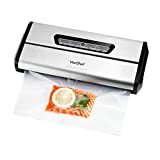 If you are going to be eating the food immediately, just take it out of the vacuum bag to finish and plate. For a steak or piece of poultry, that might involve grilling or searing it very quickly at high heat with additional seasonings. For vegetables, it might mean tossing with a dressing or mixing in other elements as desired. 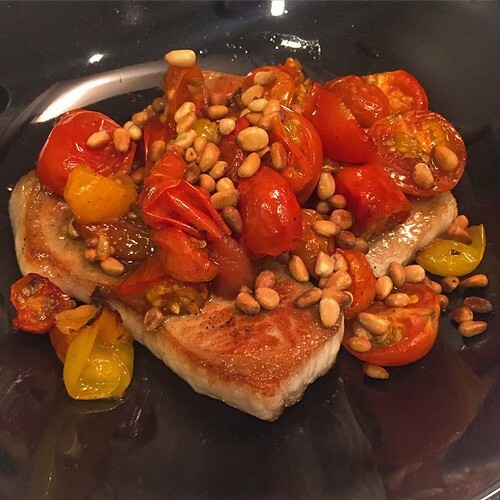 home-cooked sous vide pork chop, roasted cherry tomatoes and pine nuts. Data taken from the SousVide Supreme instruction manual. Cooking longer than the maximum recommended time can lead to an overly-soft texture. This all-in-one unit is how many home chefs today are getting started with sous vide cooking. It's easy to set up, easy to clean, and easy to operate. This is the unit I own myself for my kitchen. Note, however, that some professional chefs I've talked to consider this unit not as efficient and accurate as using an immersion circulator, which keeps the water in the bath moving. Here, the water is in a still bath surrounded by heating elements - which may result in some temperature variation that could make getting precise degrees of doneness more difficult. 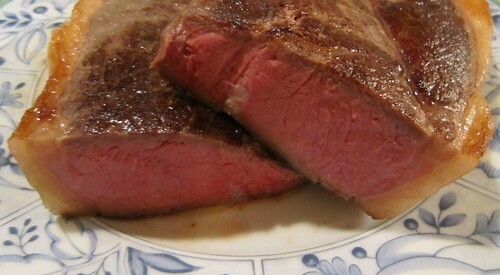 That said, so far I have had perfectly fine results using the Sous Vide Supreme. I think it is a fine introductory unit for a home chef who might not want to invest in individual equipment pieces just yet, and needs enough space in their oven to cook food for regular home meals as well as the occasional dinner party. 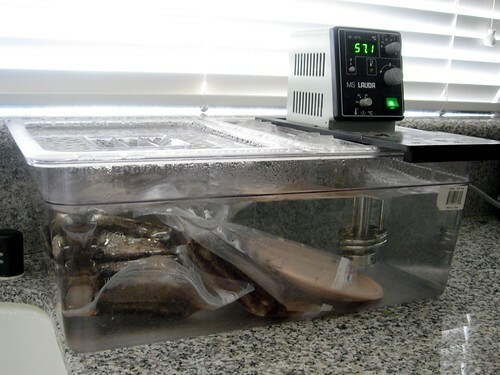 One of the main concerns people have regarding sous vide cooking is the safety of the technique. There are certain types of bacteria which can thrive and grow quickly in an oxygen-free vacuum environment - namely Clostridium botulinum which can cause the very serious condition of botulism poisoning! Cooking items long enough, and at a high enough temperature, topasteurize the food if it will not be consumed within 4 hours of preparation. There are plenty of charts and guides to let you know how long this will take. Keep in mind that foods cooked below 131 °F will never be pasteurized. If you are storing sous vide cooked food for later consumption, always chill itimmediately in an ice bath before then moving it to the refrigerator. This makes sure the food isn't lingering outside of the "safe zone" of storage temperatures, which is when bacterial growth can bloom. 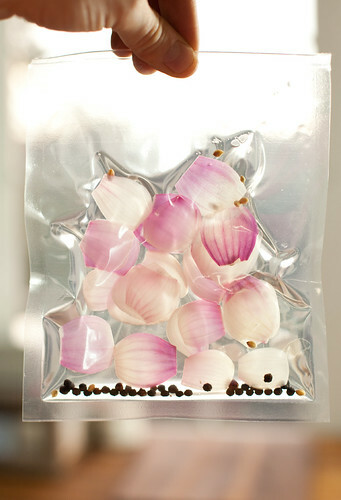 Use only vacuum bags that are designed to be food safe for cooking. Be sure of your food sources and use fresh, high quality ingredients as much as possible. It is also recommended that pregnant women and those with compromised immune systems avoid any sous vide food that has not been cooked through to pasteurization. Articles from the Modernist Cuisine website on sous vide cooking and unique recipes for it. Recipes, equipment, and further reading materials on the subject of sous vide cookery. Manufacturer of Sous Vide equipment, the Smoking Gun, the AntiGriddle, and other innovative tools for chefs. 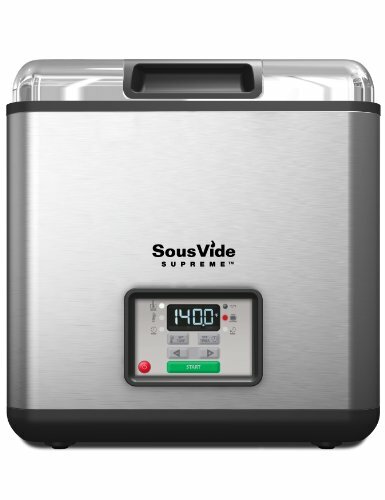 SousVide Supreme is the world's finest water oven for home cooks and culinary professionals. The all-in-one, easy to use sous vide cooking appliance for perfectly cooked gourmet quality meals. candy47 - yes, it's a bit of a novelty technique outside of professional kitchens yet, but more and more people are exploring it at home. I love it for weekdays when I can just throw something in a vacuum bag with some seasonings, get it cooking early, and come back a few hours later and have dinner just about ready to go. Interesting. I've never heard of sous vide cooking. Thanks for enlightening me onto something new!